See Sharp Press, 9781884365799, 146pp. 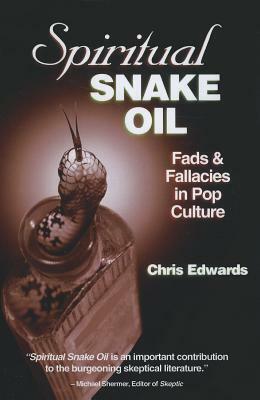 "Spiritual Snake Oil" shows that the same fallacies that plague religious apologetics also infect virtually all "new age" and "spiritual" writing. Author Chris Edwards does this by dissecting the arguments and assertions of the most prominent "new age" icons and "spiritual" writers. They include Robert Pirsig ("Zen and the Art of Motorcycle Maintenance"), James Redfield ("The Celestine Prophecy"), Deepak Chopra ("Life After Death"), Dinesh D'Souza ("Life After Death"), Francis Collins's ("The Language of God"), Rhonda Byrne ("The Secret"), and even Michael Crichton (a surprising defender of New Age thinking). As Edwards shows, the same fallacies, the same errors in argument, show up time after time in the writings of these--and virtually all other--"new age" and "spiritual" writers. In addition to explaining these fallacies in the chapters devoted to the individual authors, Edwards devotes a final chapter, "A Compendium of Fallacies," to outlining the tricks and deceptive practices common to illogical arguments. Chris Edwards is the author of "Disbelief 101" and haswritten extensively for many skeptical andsecularist periodicals, includingthe two most prominent, "Free Inquiry" and "Skeptic.""